Today’s Gospel is different from any we have seen during the long seasons of Lent and Easter. On Sunday after Sunday, the Gospels have reported actions of Jesus. They have been passages full of conversations and events that moved His story along, culminating in His Ascension into Heaven and His promise to send the Holy Spirit. Today, however, St. John gives us a kind of summary of this. It is simple, but what a sweep it has! 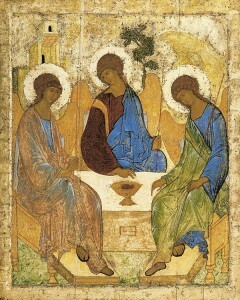 Read the first verse carefully so as not to miss its impact through familiarity: “God so loved the world that He gave His only Son, so that everyone who believes in Him might not perish but might have eternal life.” If we understand the scope of this statement, we will know why it is perfectly fitting that today is Trinity Sunday. “God so loved the world” inevitably takes us all the way back to Creation, where we first meet “God” and “the world.” Why does God love the world so much? We can’t fully answer this without figuring out why He made the world in the first place. As we read through the first few chapters of Genesis, the one thing we immediately grasp is that the physical world exists as a home for the crown of creation: man and woman. In a brief but remarkably important verse, we see God’s intention for mankind: “Let us make man in Our image, after Our likeness” (Gen 1:26). Surely this doesn’t tell us everything we’d like to know about our creation, but it tells us what we most need to know. God, the “Us” in this verse, wants man to be like Him. First, notice the paradox. There is plurality in the language of singularity. There is only one God creating the universe, but this God is “Us.” Mysterious! It will take a very long time for the meaning of this paradox to be made clear. Next, implicit in this statement is an invitation. Why make man in “Our” image and likeness if not to welcome him into the communion and fellowship of “Us”? This is vital information. If man is made in the image of the God Who is “Us,” then man is made for communion with the “Us” of God. In addition, we find in the next chapter of Genesis that “it is not good” that man should be alone (Gen 2:18). This was the only thing in creation pronounced “not good” by God. It makes perfect sense, however. If we are like the God Who is “Us,” then we are meant for communion with other beings like us. This would be a true reflection of being in God’s image. As we read on in Genesis, we find that God’s plan was seriously interrupted by man’s disobedience. Adam and Eve’s willfulness broke their communion with God and with each other. They incurred God’s just punishment, but because “God so loved the world,” He made them a promise. A “woman” and her “seed” would someday do battle with the Enemy who seduced them into rebellion. In the meantime, they were expelled from the Garden, but it was not destroyed. That hinted at the possibility of a return. So, very early on, the stage is set for the drama of salvation that needs the rest of history to unfold. We began to explore that history in Advent, when we discovered that a young girl in Nazareth was “the woman” promised by God, and her “seed” was Jesus, God’s own Son, Who existed from the beginning but became a Man in the Incarnation. The “Us” of Genesis is beginning to take shape. Lent and Easter rehearsed the truly unimaginable history of God’s Son dying in our place to lift the punishment pronounced on us (as children of Adam) in the Garden. He experienced God’s just judgment for us, and in His Resurrection, He defeated Satan, sin, and death in one fell swoop. Then, in a move no one could have predicted, when He ascended into Heaven, King Jesus sent the Holy Spirit to complete the long-standing intention of God at Creation. It is the Holy Spirit, God’s own life in us, Who makes it possible for man to step into the fellowship for which he was made, not only with the “Us” of God, now fully revealed to be God the Father, Son, and Holy Spirit, but also with one another. Wow! Possible response: Blessed Trinity, thank You for all You have done to welcome me into Your fellowship for eternity. I was made for this. Having reviewed the scope of salvation in our Gospel reading, we can now examine one piece of the vast history that led St. John to write, “God so loved the world.” Here we find ourselves on Mt. Sinai, as Moses returns to the LORD’s presence after Israel’s apostasy with the golden calf. In his fury at seeing for himself the orgiastic rebellion of God’s people, Moses threw the first set of the tablets of God’s Law down, shattering them in a prophetic demonstration of what the people had done by their disobedience. Moses interceded on their behalf, however, and God accepted his mediation. Now, Moses takes another set of tablets into the LORD’s presence so that He can write His Law on them a second time for His people. Not included in today’s reading is Moses’ request that God do more than re-write the tablets: “Moses said, ‘I pray Thee, show me Thy glory” (Ex 33:18). Even with Moses’ long friendship with God, his heart’s desire was for “more,” as it should be for us, too. God grants his request, passing by him as he was protected in the cleft of a rock. In a very rare self-description, God identifies Himself as mercy, grace, patience, kindness, and faithfulness. Notice in this encounter the shadowy suggestion of the Trinity: “Having come down in a cloud, the LORD stood with Moses.” God in Heaven (the Father) comes down in a cloud (the Spirit), and stands, passing by like a man (the Son). When Moses experiences this, he “bowed down to the ground in worship,” as we are called to do on Trinity Sunday. Look carefully at Moses’ request for God’s wayward people: “…do come along in our company. This is indeed a stiff-necked people; yet pardon our wickedness and sins, and receive us as Your own.” What is he asking? Possible response: Blessed Trinity, I ask of You, for myself and the Church, what Moses asked on Sinai: “Do come along in our company” this day. Possible response: Blessed Trinity, I can feel in these words the ecstasy of Your reign over all creation. Help me keep this vision! It dims for me sometimes. This epistle reading, with amazing brevity, helps us to see the practical application of the work of the Holy Trinity on our behalf. Imagine if we asked of St. Paul, “What difference does the doctrine of the Trinity make to my daily life?” Good question! Here is his answer. Let us savor every simple phrase: Brothers and sisters, rejoice (the only appropriate response to the work of the Trinity). Mend your ways (Jesus has conquered sin and given us His Spirit; live in that victory). Encourage… agree… live in peace…greet each other with a holy kiss (live the unity won for us by the Trinity). The God of love and peace will be with you (Moses’ request for God’s presence among His people has been accomplished by the Trinity). The grace of the Lord Jesus Christ and the love of God and the fellowship of the Holy Spirit be with you all (Blessed be the Most Holy Trinity today!). Possible response: Read the epistle again—it IS our response. This entry was posted in A, Sunday Lectionary Readings, Year. Bookmark the permalink.